13/06/14 -- EU grains markets were mixed, although wheat was mostly lower again, with London wheat setting a new lowest close for a front month since July 2010, and new crop Nov 14 setting a fresh lifetime contract low of GBP136.75/tonne. The latter has now lost GBP25/tonne in the past two months, or more than 15% of its value. The day ended with Jul 14 London wheat down GBP0.95/tonne at GBP138.75/tonne, and with new crop Nov 14 London wheat also GBP0.95/tonne lower at GBP137.00/tonne. Nov 14 Paris wheat ended EUR0.50/tonne lower at EUR187.25/tonne (a nine month low for a front month), Aug 14 Paris corn rose EUR0.25/tonne to EUR176.50/tonne, whilst Aug 14 Paris rapeseed increased EUR2.75/tonne to EUR351.25/tonne. Losses for the week on old crop London wheat were GBP6.25/tonne, whilst the new crop fell GBP6.10/tonne. Paris wheat was down EUR5.75/tonne, corn was EUR2.00/tonne lower, whilst rapeseed managed a EUR7.00/tonne rise. One of the reasons why wheat in London is coming off worse than in Paris is sterling strength - the pound closed above 1.25 against the euro tonight for the first time since November 2012. It's also very close to its best levels against the US dollar since October 2008, following last night's statement from BoE governor Mark Carney that a UK interest rate rise could be on the cards before the end of the year. Another reason is talk that excess rains in parts of Eastern Europe, whilst boosting yields, may be cutting quality a little. 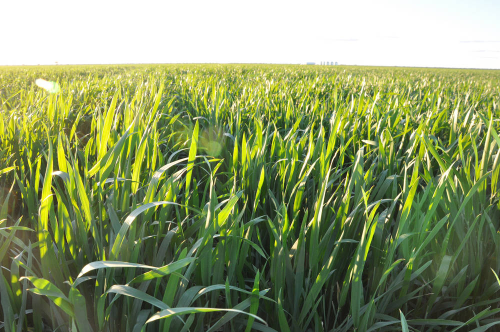 Romania are expecting a wheat crop of around 8 MMT, a 0.5 MMT rise on production last year, but they could be in for a larger proportion of that being feed wheat rather than milling grade it is being suggested. Nevertheless, new crop Romanian wheat was amongst the cheapest on offer in this week's Egyptian tender at $248.50 plus $10.25 freight. That's the equivalent in sterling of less than GBP152.50/tonne delivered. And bear in mind that this is for 12.5% milling wheat, taken from the farm to the docks, put on a boat and shipped to Egypt! Compared to that, the GBP130/tonne ex farm that one firm were offering for East Anglian feed wheat ex the combine at Cereals 2014 this week was more than generous. The 2014 harvest in Ukraine is now underway in the Odessa region, where yields are not expected to match last year but still be above average. Very early reports say that the early grain harvest there is averaging yields of 2.59 MT/ha, down only modestly on 2.7 MT/ha this time last year. There are also reports of some early harvest activity in the Adygea region of southern Russia, close to Kransnodar. I hesitate to report the yields that I have seen being reported as I cannot verify their accuracy. Let's just say that they are a lot higher than those being reported out of Ukraine. Spring grain planting in Kazakhstan meanwhile is all but completed on 14.825 million hectares, or 99.3% of the Ministry's estimate. French wheat is 100% headed, according to FranceAgriMer, which is 20 points higher than this time a year ago. French spring barley is a stunning 97% headed, up from 62% last week and compared to only 19% this time last year. They said that 77% of the French corn crop now has at least 6-8 leaves visible, versus only 32% a year ago. The proportion of the French winter wheat crop rated good to very good fell 2 points on a week ago to 72%, although that's still better than 68% this time last year. Winter barley rated good/very good was down 3 points on last week to 68%, although again that's still ahead of 67% this time last year. Spring barley rated good to very good came in at 67% versus 69% last week and 71% a year ago. Corn was rated 88% good to very good, the same as last week and well ahead of only 58% this time last year. Brussels reported that they'd issued 464 TMT of soft wheat exports this past week, taking the season to date total to 27.2 MMT, up 48% on a year ago. They also authorised 13.8 MMT worth of corn imports, taking the 2013/14 season total so far to 13.8 MMT. For now though it's all about new crop, and the prospects for that look very good indeed. The trend remains lower. 12/06/14 -- Soycomplex: Beans closed lower, especially at the front end, despite supportive old crop export sales. Once again, we can maybe best attribute this to fund liquidation of front-end longs ahead of first notice day. Weekly export sales of 86,700 MT of old crop and 403,300 MT of new crop were in line with trade expectations on the latter, and beat them on the former. Shipments themselves were 147,088 MT, taking the marketing year total to 43.08 MMT. Add on another 2 MMT of outstanding sales and we get total commitments of over 45 MMT versus a USDA forecast for the season of 44.225 MMT. The USDA made only minor changes to the world balance sheet yesterday, with production among all the major nations unchanged, ditto exports. World 2014/15 ending stocks were tweaked slightly higher to a record 82.9 MMT, a near 31% increase on this season. Macquarie estimated the 2014 US soybean crop at 3.682 billion bushels. Informa are due out tomorrow with their US 2014 acreage and production estimates. Last month they had the acreage at 82.1 million and production at 3.635 billion bushels. Jul 14 Soybeans closed at $14.15 1/4, down 30 1/4 cents; Nov 14 Soybeans closed at $12.12 1/4, down 8 1/2 cents; Jul 14 Soybean Meal closed at $469.20, down $13.10; Jul 14 Soybean Oil closed at 38.58, up 16 points. Corn: The corn market finished with modest gains of around 2-3 cents. Weekly export sales of 409,700 MT of old crop and 105,500 MT of new crop, as with beans, were in line with trade expectations on the latter, and beat them on the former. Actual shipments of just over 1 MMT take the total exported so far this season to 34.84 MMT, which along with outstanding sales of 11.72 MMT take total commitments to 46.56 MMT versus a USDA forecast of 48 MMT for the season. South Korea's NOFI seeks 140,000 MT of optional origin corn for Dec-Jan shipment. Macquarie said that the USDA’s 2013/14 Chinese corn import estimate is too optimistic. The Buenos Aires Grains Exchange estimated Argentina’s 2013/14 corn crop at 25.0 MMT versus a previous estimate of 24.0 MMT. The latter figure is also the current one being used by the USDA. MDA CropCast raised their forecast for the Ukraine corn crop by 1.2 MMT from a week ago to 26.3 MMT. The USDA yesterday increased their outlook on Ukraine from 26 MMT to 27 MMT. Informa are due out tomorrow with revised US acreage and production estimates. Last month they had the 2014 US corn area at 91.6 million acres, with production at 13.935 billion bushels. The USDA will update their US 2014 acreage estimates at the end of the month. The USDA yesterday slightly raised their outlook for the world 2014/15 corn crop to 981 MMT, which is broadly similar to last season's record production. They see ending stocks rising from 169 MMT to over 182 MMT next season. Jul 14 Corn closed at $4.44, up 3 cents; Sep 14 Corn closed at $4.40, up 2 1/2 cents. Wheat: The wheat market closed mixed, with Chicago and Minneapolis lower and Kansas a little higher. Weekly export sales came in at 570,100 MT. That was a bit better than expected, supported by continued good demand from Brazil who took 167,600 MT of that total. The figures showed that the US finished the old 2013/14 marketing year which closed on May 31 with exports of 30.1 MMT, falling short of USDA forecasts. Yesterday they lowered their expectations for US wheat exports in 2014/15 to 25.5 MMT from 26 MMT previously. MDA CropCast raised their forecast for the world wheat crop in 2014/15 by 5.2 MMT from last week, citing favourable crop conditions in Europe and China. SovEcon lowered their outlook on Russia's 2014/15 grain crop from 88-92 MMT to 87-90 MMT versus 92.4 MMT last year. They cut their estimate on Russia's wheat crop by 1 MMT to 49 MMT. Official Ministry estimates are still higher than this. FranceAgrimer estimated 2013/14 French soft wheat exports outside the EU at 12.0 MMT versus a previous estimate of 11.6 MMT. Egypt bought Russian and Romanian wheat in their tender. French and US wheat was priced out. UkrAgroConsult said that Ukraine's winter barley harvest has started couple of weeks earlier than last year. Informa are due to release their latest US acreage figures tomorrow. Last month they had the US all wheat area at 56.1 million acres. Jul 14 CBOT Wheat closed at $5.85 1/4, down 4 cents; Jul 14 KCBT Wheat closed at $7.05 1/2, up 1 1/4 cents; Jul 14 MGEX Wheat closed at $6.82, down 2 cents. 12/06/14 -- EU grains closed mostly lower on the impending outlook for bumper, and imminent, production here in Europe this year. The day ended with the relatively thinly Jul 14 London wheat contract down GBP0.05/tonne at GBP139.70/tonne and with new crop Nov 14 London wheat closing GBP1.80/tonne lower at GBP137.95/tonne. Nov 14 Paris wheat closed down EUR1.50/tonne at EUR187.75/tonne, Aug 14 Paris corn slid EUR1.00/tonne to EUR176.25/tonne and Aug 14 Paris rapeseed was EUR1.25/tonne firmer at EUR348.50/tonne. 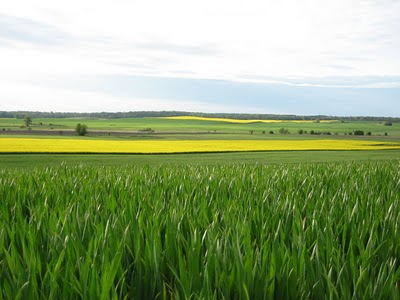 The prospects for near record 2014 EU-28 wheat production, and an all-time high rapeseed crop, are becoming closer to a reality with ever passing day. MDA CropCast today raised their forecast for the 2014/15 EU wheat crop by 2.9 MMT from last week, along with a 0.2 MMT rise in corn output, a 0.5 MMT increase for the barley crop and a 0.84 MMT hike in rapeseed production. The German Farm Co-operative raised their estimate for the all wheat crop there from 24.94 MMT last month to 25.5 MMT this time round, a 1.9% increase on production last year. They also increased their view on this year's rapeseed crop by 300 TMT from last month to 5.9 MMT, a 2.2% rise on a year ago. The USDA yesterday pegged the EU-28 wheat crop at 146.25 MMT this year, the second highest on record, 1% higher than a month ago and 2% up on last year. They now see the French crop at 38.5 MMT, which is probably about right. They could however still be too low on Germany (24.3 MMT) and the UK (15.15 MMT). The USDA also upped their estimates for EU corn, barley and rapeseed production this year to 65.25 MMT (which is the highest since at least the 1990's), 55.88 MMT and 22.0 MMT (record) respectively. Egypt's GASC bought two cargoes of Romanian and one of Russian wheat in a tender for late July shipment. They've increased the maximum moisture allowable on their wheat tenders to 13.5%, which in theory gives French wheat a better chance of competing. There's still a fairly stiff penalty for wheat over 13% moisture however, which may make traders reluctant to offer French material at least until the new crop is harvest is in. The price paid by GASC for the Romanian wheat was said to be more than $40/tonne cheaper than the price that they paid for Ukraine wheat only a month ago. French material was offered, but at more than $10/tonne more than Romanian, and that was before more expensive freight was also factored in. There was noticeably more interest in this Egyptian tender than recent ones, which may reflect the fact that the new crop harvest will be underway in many places by then. They are said to be harvesting winter barley in Ukraine now, and winter wheat is expected to be cut in the south of Russia around a week from now. I'm just back from a trip to Cereals 2014, where the general mood amongst the farmers seemed to be pleased that the crops are looking so well, but not so pleased with the prices on offer. How much lower can it (wheat) go? That was perhaps the question that most people were asking. Who knows, there could be another GBP10-20/tonne in it yet, seemed to be the general consensus among many of the traders I spoke to. One or two did make the point that just about all the bad news is surely in the marketplace now, so there could be some upside once the harvest is out of the way. After two successively poor production years, it looks like the UK is back on track to have a good year production-wise. The fact that the last two have been poor though means that farmers have been very wary of committing too much tonnage too early this year. That leaves them caught between a rock and a hard place. Growers are generally only 20-25% forward sold "at best" was the recurring opinion on offer. That potentially leaves much more grain to market at harvest time than normal this year, and that could be a big problem - especially with the pound sitting so strong. Comments from the Bank of England governor Mark Carney, in his Mansion House speech tonight, that a UK interest rate rise could happen sooner than the market currently thinks look set to take sterling up to 1.25 against the euro and near 1.70 versus the US dollar in the morning. The last time the pound was up above those levels was Nov 2012 in the case of the former and October 2008 for the latter. Neither will of course help export prospects, but both will make wheat and corn imports cheaper. The UK imported 157 TMT of corn in April, according to the latest available set of customs figures, that takes the 2013/14 import total so far to 2.08 MMT, up more than 50% on year ago levels. 11/06/14 -- EU grains closed mixed, but mostly lower with old crop Jul 14 London wheat setting a new lowest close for a front month in almost years. New crop Nov 14 also set a sub-GBP140/tonne contract low. The day ended with Jul 14 London wheat down GBP2.75/tonne at GBP139.75/tonne, and with new crop Nov 14 GBP1.00/tonne lower also at GBP139.75tonne. Nov 14 Paris wheat fell EUR1.00/tonne to EUR189.25/tonne, Aug 14 Paris corn was EUR0.50/tonne easier at EUR177.25/tonne and Aug 14 Paris rapeseed finished EUR0.50/tonne higher at EUR347.25/tonne. The pound rose above 1.24 against the euro for the first time since late 2012, which didn't help London wheat. A Bloomberg survey pegged the European wheat crop at a six year high 145.9 MMT, and the second largest ever. Australia's ABARES trimmed slightly their forecast for the nation's 2014 wheat crop from 24.8 MMT to 24.6 MMT. Having only just raised their estimate from 95 MMT to 96 MMT, IKAR cut their forecast for Russia's 2014 grain crop to 93.5 MMT, although that's still slightly higher than last year. Late in the day the USDA raised their estimate for the EU wheat crop to 146.25 MMT from 144.88 MMT. They also increased their outlook on Russia's wheat crop by 1 MMT to 53 MMT. Russia's 2014/15 wheat export potential was raised by 0.5 MMT to 19.5 MMT, which is now 1 MMT more than this season. 10/06/14 -- Soycomplex: Beans ended a little firmer heading into tomorrow's USDA report. China sold 134,528 MT of soybeans at auction, or around 37% of what was on offer. The reason for the low level of interest was said to be due to the fact that the beans on offer were mostly from the 2011 crop. Dr Cordonnier estimated 2014 US soybean yields at 45.0 bu/acre versus a previous estimate of 44.5 bu/acre. He estimated the 2013/14 Brazilian soybean crop at 86.5 MMT, with Argentina at 55.0 MMT, both are unchanged from his previous estimates. CONAB lowered their estimate for the Brazilian soybean crop to 86.1 MMT. Trade estimates for tomorrow's WASDE report have 2013/14 US soybean ending stocks at 127 million bushels, from within a range of estimates of 119–139 million and 130 million last month. New crop carryout is seen at a more generous 319 million bushels, from within a range of estimates of 245-364 million and 330 million last month. Jul 14 Soybeans closed at $14.62 1/2, up 5 1/2 cents; Nov 14 Soybeans closed at $12.29 1/2, up 5 1/4 cents; Jul 14 Soybean Meal closed at $484.50, up $2.30; Jul 14 Soybean Oil closed at 38.94, down 34 points. Corn: The corn market closed around 5-6 cents lower. CONAB have the Brazilian corn crop estimated at 77.9 MMT versus a previous estimate of 75.19 MMT. Dr Cordonnier estimated 2014 US corn yields at 165.0 bu/acre versus a previous estimate of 164.0 bu/acre. He has the 2013/14 Argentine corn crop at 24.0 MMT and the Brazilian corn crop at 74.5 MMT. Both are unchanged from previous his estimates. The Rosario Grains Exchange estimated Argentina’s 2013/14 corn crop at 24.5 MMT versus a previous estimate of 23.9 MMT. Argentina's corn harvest is being estimated at only 41% complete versus 77% on average for this time of year. Trade estimates for Wednesday's WASDE report have 2013/14 US corn ending stocks at 1.170 billion bushels, from within a range of estimates of 1.121–1.279 billion and the USDA's May estimate of 1.146 billion. Carry-out next season is seen at 1.716 billion, from a range of estimates of 1.405–2.282 billion and the USDA's May estimate of 1.726 billion. Jul 14 Corn closed at $4.45 1/2, down 5 1/2 cents; Sep 14 Corn closed at $4.41 1/4, down 6 1/4 cents. Wheat: The wheat market ended sharply lower, dragged down by corn. CONAB now have the 2014 Brazilian wheat crop estimated at 7.37 MMT versus a previous estimate of 6.88 MMT. That's sharply higher than 5.3 MMT a year ago, and also much higher than the USDA's current forecast of 6 MMT. High wheat prices relative to corn are encouraging increased wheat plantings in South America this year. The Rosario Grains Exchange estimated Argentina’s 2014/15 wheat planted area at 4.4 million hectares, up 22% from a year ago. ABARES come out tomorrow with their Australian crop estimates. In tomorrow's WASDE report the US all wheat crop has an average estimate of 1.964 billion bushels, from within a range of estimates of 1.903-2.041 billion. The USDA's May estimate was 1.963 billion and the 2013 US all wheat crop was 2.130 billion. US 2013/14 wheat ending stocks are seen at 590 million bushels, with a range of estimates of 565-625 million and the USDA's May estimate of 583 million. US 2014/15 wheat carry out is forecast at 552 million bushels, from within a range of estimates of 475-658 million and the USDA's May estimate of 540 million. Jul 14 CBOT Wheat closed at $6.01 1/4, down 11 1/4 cents; Jul 14 KCBT Wheat closed at $7.26, down 7 3/4 cents; Jul 14 MGEX Wheat closed at $6.99 1/2, down 5 cents. 10/06/14 -- EU grains markets were mixed in relatively quiet trade. The strong pound, which traded close to 1.24 against the euro for the first time since late 2012, didn't help London wheat. The day ended with Jul 14 London wheat unchanged at GBP142.50/tonne, and with new crop Nov 14 London wheat GBP0.80/tonne lower at GBP140.75/tonne. Nov 14 Paris wheat ended EUR0.50/tonne lower at EUR190.25/tonne, Aug 14 Paris corn rose EUR0.25/tonne to EUR177.75/tonne, whilst Aug 14 Paris rapeseed increased EUR2.25/tonne to EUR346.50/tonne. Fund money seems to be flowing out of the grains sector in favour of perceived better returns from equities. Both the Dow Jones Industrial Average and the S&P 500 closed at all time highs last night. The German DAX also closed above 10,000 for the first time ever yesterday, whist the FTSE 100 trades close to a 14 year high set on May 14. The Russian Deputy Ag Minister said that this year's harvest (excluding Crimea) would increase 4 MMT on last year to 96.8 MMT, and that the total could be "much higher" given beneficial rains. The 15-day forecast for Russia is cooler and wetter for much of the country. Pro Zerno forecast a record Russian oilseed crop in 2014, with winter OSR production of 1.6 MMT versus 1.4 MMT a year ago. They see Russian soybean production at 2.25 MMT compared to 1.63 MMT last year. The Russian Ministry said that the country had exported 24.7 MMT of grains so far this year (to Jun 4), a 61.4% increase on a year ago. That total includes 17.95 MMT of wheat, 2.51 MMT of barley and 3.93 MMT of corn. Ukraine's 2013/14 marketing year to date grain exports now stand at 31.62 MMT, including 9.11 MMT of wheat, 2.35 MMT of barley and 19.82 MMT of corn. Algeria was said to have bought around 200 TMT each of new crop milling wheat and barley in tenders last week. The price paid for the wheat was said to be around $276.50/tonne C&F. 09/06/14 -- Soycomplex: The market closed mixed, in the red nearby and with modest gains further forward. Once again this can be put down to the unwinding of spreads and funds rolling out of their front-end longs. There may also have been an element of profit-taking on old crop positions ahead of Wednesday's USDA WASDE report. Trade estimates for that have 2013/14 US soybean ending stocks at 127 million bushels, from within a range of estimates of 119–139 million and 130 million last month. New crop carryout is seen at a more generous 319 million bushels, from within a range of estimates of 245-364 million and 330 million last month. World ending stocks next season are seen being close to a record 82 MMT, up sharply from an anticipated 66.4 MMT in 2013/14. Today the USDA reported the sale of 117 TMT of new crop beans to China. Weekly US soybean export inspections were 123,115 MT. Customs data shows that China imported 5.97 MMT of beans in May versus 6.50 MMT in April. China has now imported 27.8 MMT of beans so far this calendar year, up 35.3% versus Jan/May 2013. CONAB come out tomorrow with their 2013/14 Brazilian crop estimate updates. Last month they had the 2013/14 bean crop estimated at 86.57 MMT and exports estimated at 45.3 MMT. After the close the USDA said that 87% of the 2014 US soybean crop was now planted, up from 78% a week ago and higher than the 5-year average pace of 81%, although maybe at the low end of trade expectations. The crop is 71% emerged versus 50% a week ago and 62% on average. The first crop condition ratings of the season had 74% of the crop rated good/excellent. Jul 14 Soybeans closed at $14.59, up 2 cents; Nov 14 Soybeans closed at $12.23 1/4, up 4 1/2 cents; Jul 14 Soybean Meal closed at $482.70, down $4.90; Jul 14 Soybean Oil closed at 39.31, up 30 points. Corn: The corn market closed sharply lower following China's announcement that it was to ban imports of US DDGS with immediate effect. That would seem to suggest that the ongoing dispute over MIR 162 corn with the US is as far away from being resolved as ever. Fund money was seen as being a net seller of around 10,000 corn contracts on the day, as they appear to be systematically reducing the size of their length. Trade estimates for Wednesday's WASDE report have 2013/14 US corn ending stocks at 1.170 billion bushels, from within a range of estimates of 1.121–1.279 billion and the USDA's May estimate of 1.146 billion. Carry-out next season is seen at 1.716 billion, from a range of estimates of 1.405–2.282 billion and the USDA's May estimate of 1.726 billion. Before that we have CONAB out with their Brazilian crop estimates tomorrow. Last month they had the 2013/14 total corn crop there estimated at 75.19 MMT. Weekly US corn export inspections today were 1,147,968 MT, compared to 980,053 MT a week ago. After the close the USDA said that 2014 US corn planting is now effectively over. They had emergence at 92% versus 80% a week ago, 83% this time last year and 90% for the 5-year average. Crop conditions came in at 75% good/excellent, a 1 point drop on last week, but far higher than 63% this time last year. Kansas at 8% poor/very poor is the state with the worst ratings. On the weather front: "The forecast calls for above-normal rainfall again this week in the Midwest and Mid South. Dry conditions would prevail in the Great Lakes area allowing wet fields to recover. Much cooler air is settling into the US heartland. Morning temperatures have dropped into the low 50s F. The forecast calls for sharp cooling this week that would retard development in corn and soybeans. Northern Midwest corn is most at risk for retarded growth and development. The southern half of the corn belt is further along developmentally, and would not suffer as much from strong cooling," said Martell Crop Projections. Jul 14 Corn closed at $4.49 3/4, down 9 1/4 cents; Sep 14 Corn closed at $4.46 1/4, down 10 cents. Wheat: The wheat market closed lower across the three exchanges, not helped by weakness in corn. Weekly export inspections came in at a ho-hum 518,866 MT, down from 532,901 MT a week previously. Trade estimates for Wednesday's WASDE report have the US all winter wheat crop at an average estimate of 1.394 billion bushels, from within a range of estimates of 1.330–1.445 billion. The USDA's May estimate was 1.403 billion and the 2013 US winter wheat crop was 1.534 billion. The US all wheat crop has an average estimate of 1.964 billion bushels, from within a range of estimates of 1.903-2.041 billion. The USDA's May estimate was 1.963 billion and the 2013 US all wheat crop was 2.130 billion. US 2013/14 wheat ending stocks are seen at 590 million bushels, with a range of estimates of 565-625 million and the USDA's May estimate of 583 million. US 2014/15 wheat carry out is forecast at 552 million bushels, from within a range of estimates of 475-658 million and the USDA's May estimate of 540 million. Ahead of CONAB's report tomorrow, they had Brazil's 2014 wheat crop estimated at 6.88 MMT last month. They won't begin harvesting that until October, prior to that they are seen as still being a featured buyer of US wheat. There's talk that Brazil could buy up to 1.5 MMT of US wheat before their own and Argentina’s wheat harvest begins later in the year. Reports suggest that China has harvested more than 60% of their winter wheat crop on 11.47 million hectares. After the close the USDA said that 86% of the US 2014 winter wheat crop is now headed, which is one point higher than the 5-year average and 5 points ahead of a year ago. They left the crop at only 30% good/excellent, one point down on this time last year. They said that harvesting was 9% complete on a national level, which is 3 points behind average. Spring wheat planting is 95% done versus 93% normally, emergence is 80% compared to 82% on average. 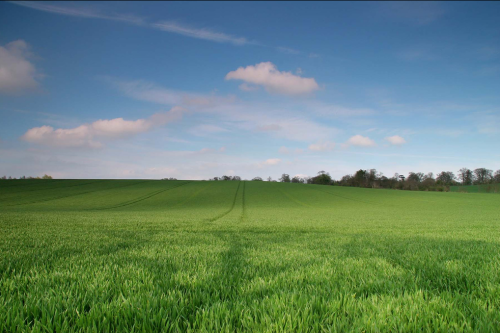 They estimated the spring wheat crop at 71% good/excellent versus 62% this time a year ago. Jul 14 CBOT Wheat closed at $6.11 3/4, down 6 1/2 cents; Jul 14 KCBT Wheat closed at $7.34 1/4, down 1 1/4 cents; Jul 14 MGEX Wheat closed at $7.03 1/2, down 5 3/4 cents. 09/06/14 -- EU grains closed mostly lower after an attempt to rally proved to be short lived. 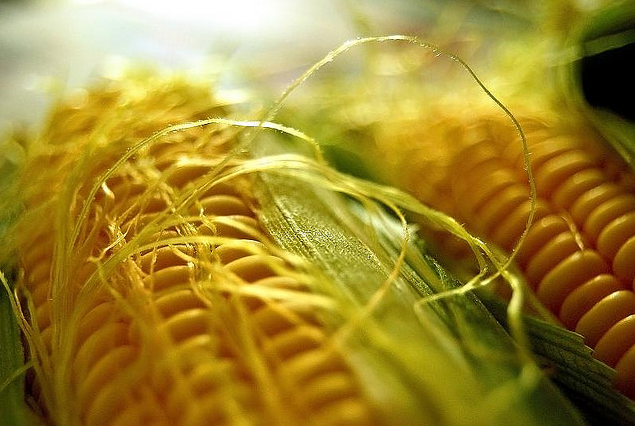 News that China had banned the importation of US DDGS with immediate effect due to their possible "contamination" with the unapproved MIR 162 variety had the US corn market under pressure, and that weakness spilled over into the rest of the sector. The day ended with Jul 14 London wheat down GBP2.50/tonne at GBP142.50/tonne and with new crop Nov 14 London wheat closing GBP1.55/tonne lower at GBP141.55/tonne. Nov 14 Paris wheat closed down EUR2.25/tonne at EUR190.75/tonne, Aug 14 Paris corn was down EUR1.00/tonne to EUR177.50/tonne and Aug 14 Paris rapeseed was EUR0.25/tonne firmer at EUR344.50/tonne. Spring grain planting in Ukraine, Russia and Kazakhstan is almost complete in a timely manner. The 15-day forecast is leaning wetter in Russia and Kazakhstan which will suit, Ukraine is seen a bit drier than normal, which also won't go amiss. APK Inform said that Ukraine's seaports had exported 1.32 MMT of grains in May, down from just over 2 MMT in April. That total included 454 TMT of wheat and 633 TMT of corn. The Ukraine Ag Ministry said Ukraine has exported 31.5 MMT of grains to Jun 6, and will end the season exporting a record total of 33 MMT, up 43.5% versus 23 MMT in 2012/13. Some are suggesting that good spring rains in Ukraine might offset the anticipated reduced inputs meaning that yields aren't down too much this year after all. Morocco are tendering to buy 163,500 MT of soft wheat on the local market, in it's first purchase of the new campaign. Old crop Jul 14 London wheat is now within less than a couple of pounds of being at the lowest level for a front month in almost 4 years. China said that it had already harvested more than 60% of it's winter wheat crop. The ongoing dispute with the US over MIR 162 corn, which has virtually halted US corn exports to the country, looks no closer to being resolved after China banned the import of all US DDGS. Harvest pressure from the Black Sea region is imminent, they'll also begin cutting barley in the south of France very shortly too.